Within the last couple of decades, this term has grown to mean so much more than making sure customers are happy. Just over 70 percent of you employ a CRM solution to oversee your revenue stream. Of that number, almost 80 percent consider their CRM an investment, not an expense. I interpret that stat to mean you’re in it for the long haul. Good. That’s how software becomes effective. Bullhorn wasn’t made for real estate. It doesn’t come with drip marketing campaign tools, social media integrations or an open house scheduler. What Bullhorn does come with is a serious compendium of features for managing leads and transactions. Built with exceptional mobile functionality, Bullhorn is equally at home on your device screen as it is in your desktop browser. Fast and interconnected, Bullhorn empowers team oversight as well as it provides customer insight. Bullhorn’s most compelling distinction is “Pulse,” a real-time activity tracker that enables agency stakeholders to keep their cursors hovering closely over the revenue streams. By monitoring the frequency and efficacy of team members interaction with contacts, Pulse presents clear, historic graphs of database and internal conversations from which users can determine what made one window of time more productive than another. Pulse couples that with a more intimate look into agent activity and prospect interactions. 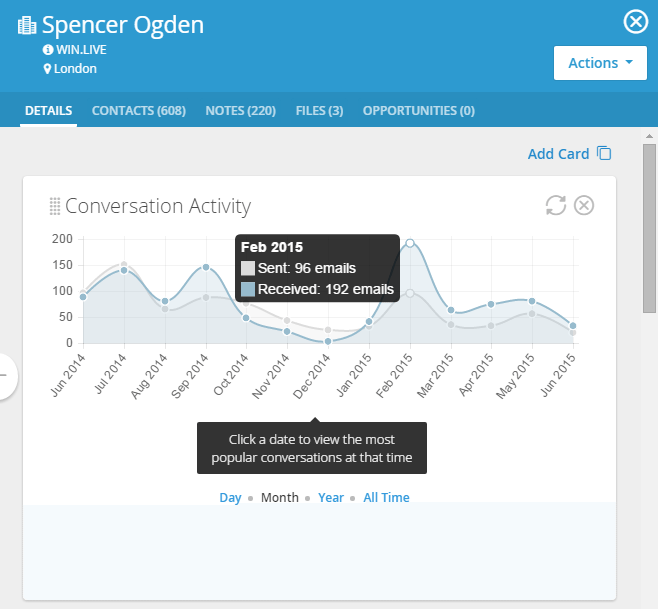 For example, Pulse uses its powerful email analytics to probe deep into an contact’s interaction with the company. From that record, it presents a single-line calendar suggesting the most effective days and times to reach that contact. Really sharp. By tracking individual contact interactions, Pulse gives brokers definitive insight into who under their masthead may need additional sales training, who is about to lead their own team, or who may not be around next month. Bullhorn also focuses intently on the job of curating pertinent emails related to contacts and transactions. Everything is neatly stacked in your Bullhorn inbox, where it’s bound to specific people and pipelines. This is done so effectively because of a technology Bullhorn calls “passive activity tracking” — a term I just had to find a way to use in this review — that casts a net over everything streaming in and out of our email accounts and calendars. Essentially, no communication gets by without Bullhorn seizing business information from it. The software’s mobile-first mentality is a byproduct of the industrywide CRM mandate of having to be accessible to be useful. Business information is always around, so should your CRM. Bullhorn’s take on this requirement is to provide you an email applet, for lack of a better term, that gives you ever-broadening access to its feature base. 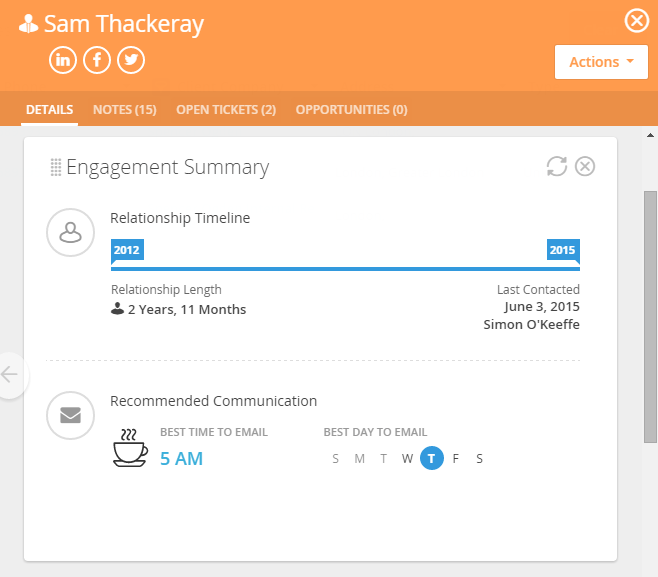 When an email comes, Bullhorn can produce a snapshot of a contact’s record. If you need a little more, it can reveal the transactions that person is a part of. It can then show you the last five notes, deals or tasks to which that person is connected. If you’re a broker and an agent sends you a message, Bullhorn for Email is an excellent way to get a snapshot look into their activity. And if you need to, just click on over into the full application and keep working. I envision most Bullhorn users working out of their email via this feature. It’s a very manageable tool that’s carefully designed to work with Outlook and Gmail. Everything in Bullhorn is malleable: You can adjust how you view each section, drag and drop to rearrange lists, and pretty much determine exactly how you interact with it. Bullhorn is heavily proven in the commercial real estate space, but its orbit in the residential cosmos has yet to be fully established. Nevertheless, this is a highly accomplished software team; its CEO wrote the first line of code. 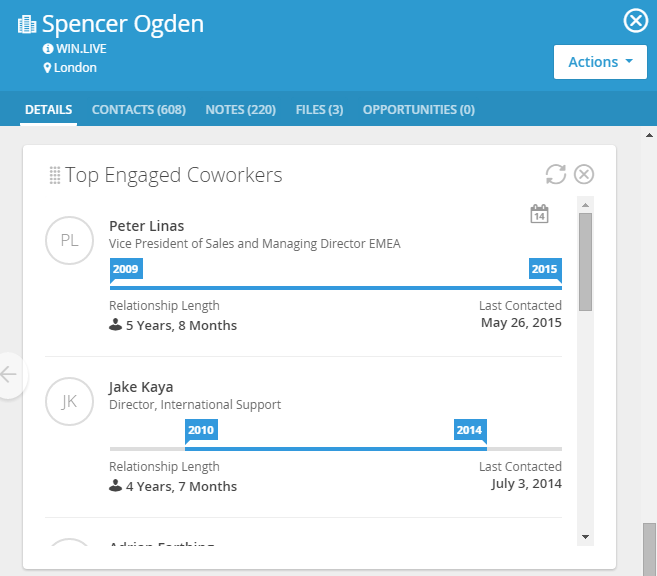 Bullhorn’s history is in staffing, as relationship-centric as it gets. I’m confident Bullhorn’s feature set and exceptional intrinsic data intelligence technology will overlap cleanly with what you need. Plus, who wants the same CRM as everyone else? Bullhorn is more than capable of managing your work and customer relationships and then ratcheting up how you make money with and from those relationships. The look and feel on all screen sizes will keep you motivated and active, and the reach of its database analysis smarts is much better than what typical real estate-only CRMs are providing. The software is used by more than 10,000 companies, so it’s clearly proven. I don’t think it’s the only CRM that will make you better at business, but I know it’s as good as everything our survey included. And in some cases, much better. Do you use Bullhorn — and what do you think? Leave a comment and let us know!